Wahana Visi Indonesia (WVI) partnered with KOHLER Company, through Kohler’s Innovation for Good program, to work together on a project to develop innovative, child-friendly handwashing facilities and program for a primary school in village of Randoria, located in small city of Ende, East Nusa Tenggara Province. Ende is located on the southern part of Flores Island. Ende has a population of 60,000 residents, which actually makes it the largest city on the island. The partnership with Kohler Company’s Innovation for Good was facilitated by Asia P3 Hub. The Innovation for Good program sends associates on sabbatical to be embedded with one of Kohler’s partners to gain field experience and “real life” insights. Kohler engineer James Bourne arrived from Kohler UK in February 2018. He spent two months working with WVI in Ende full-time to lead the design and development of handwashing and sanitation facilities at the elementary school, using a Human-Centered Design approach. 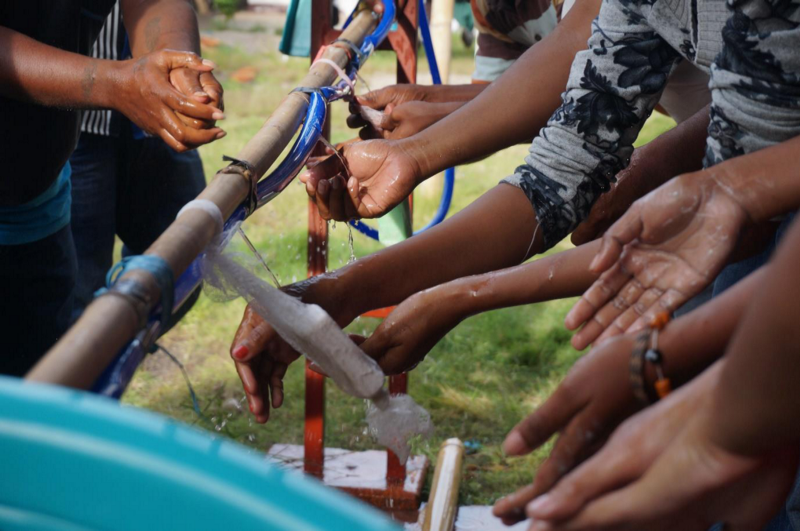 The challenge: to design and construct handwashing facilities at a local school, and to train the local community on the design processes and techniques required. The approach included building local capability in human-centred design that they could continue to use in the future. James used the Ideo.org Design Kit process with the local team and community, tackling the handwashing design challenge as a live case study through which to learn. Five facilities were constructed: three group handwashing stations, one handwashing station for teachers and one clean water piping system from water storage attached to handwashing facilities and toilets. “Nudges” around toilet and handwashing facilities were also introduced. A rainwater harvesting system was also built to support the utilization of the facilities. Transforming Both the Expert and Community: Human-Centered Design in Action! Innovating for Good: Soapy Hands make for Healthy Children!